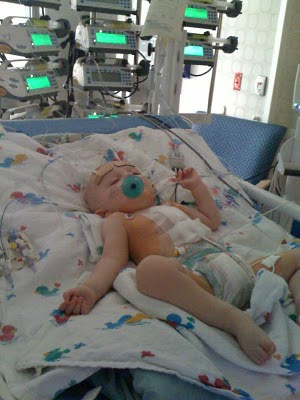 Liam's second open heart surgery was June 3, 2010. This was the "big" one for us, his full repair surgery where they were to close the large VSD and put in the homograft pulmonary conduit and removing the BT Shunt. 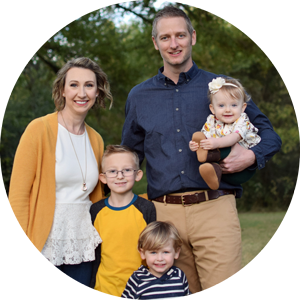 We started the day before with a heart cath, that went well, but left Liam congested and needing a lot of help from Respiratory Therapy that night. The next morning he was whisked off to surgery. Everything surgically went as best as could be expected. It was recovery that was the hard part for us. Multiple failed attempts at extubation, feeding issues...it was a rough road. We ended up staying for 15 days total, and were discharged straight from the CHSU with Liam on home oxygen. We think he had a virus going into surgery that decided to surface and cause all sorts of issues. 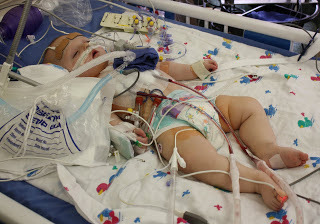 Unfortunately, when we found out about Liam's heart defect, we knew he would have to have multiple surgeries. We were hopeful it would be limited to about 3 or 4 during his lifetime. With is condition, the conduit has to be replaced due to growth. We he is about 6 or 7, they should be able to fit him with a conduit that will last him into adulthood. This being said, you can imagine was a shock it was, when on October 26, 2010, during a routine Cardiology follow up (for a 3 month follow up from the last visit), we found out there had been a "change" on the echo that needed to be looked into...Then on December 2, after a heart cath, we found out the devastating news that Liam would require yet ANOTHER surgery due to his homograft conduit deteriorating. Too soon. We were strongly urged to schedule the surgery as soon as possible due to the bad shape his homograft conduit was in. They explained that sometimes the body rejects a certain type of "prosthetic" and for the next surgery they would be using a different kind, the Contegra Bovine conduit. We scheduled the surgery for the end of December. Liam actually did really well for both the surgery and recovery, sailed through it and we were home 5 days later. To say that 2010 was a struggle for us would be an understatement. It was definitely a year of enduring one thing after the next, with merely a chance to come up for air. Since then, things have quieted down a bit. 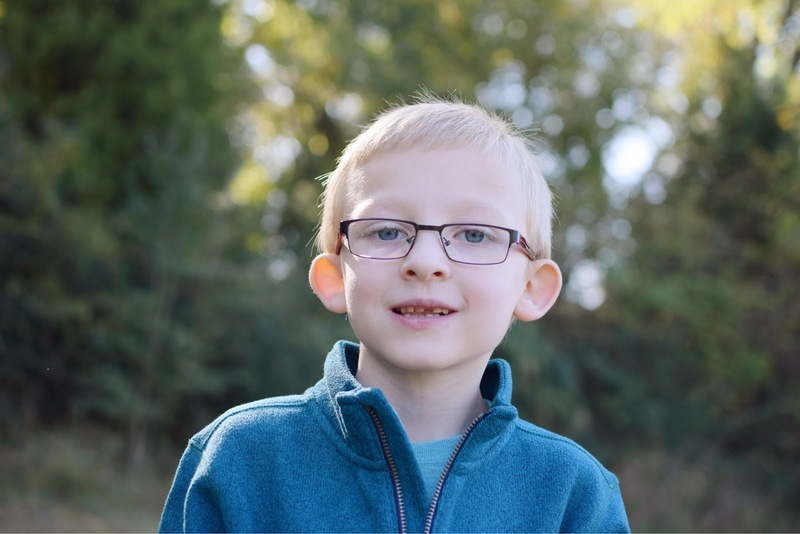 Liam has had a few more heart cath procedures since his last surgery to double check the flow rates and obstruction in his conduit, but prayerfully we have not had to have one the past several years! 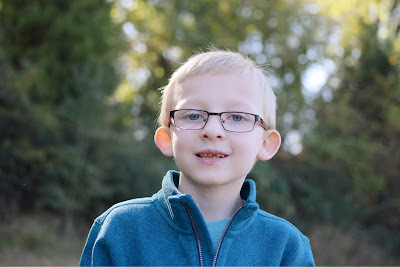 He will require one more surgery at least, and we are just waiting until the peak time to have that one performed - ideally in a few more years, so that the new conduit can be big enough to last into adulthood. 2011 was a much brighter year for us, Liam was weaned off his tube feedings finally, as it showed he was doing great orally taking food and thickend liquids. Today, Liam is fully weaned off thickener, and eats and drinks like a normal 7 year old! Praise God! Every year, he seems to be getting stronger and stronger. We were involved in occupational and physical therapy for awhile up until and after his third surgery, but eventually, he tested out of all the areas. He is a normal, healthy boy right now, and we love it that way! That's pretty much our heart story in a nutshell! As you can see, having a child with a CHD is a LIFETIME affair - there is no CURE for CHD's, only research to provide better procedures and surgical techniques to help quality of life and delay surgeries as long as possible! The continuing maintenance of Liam's CHD will be lifelong for him. 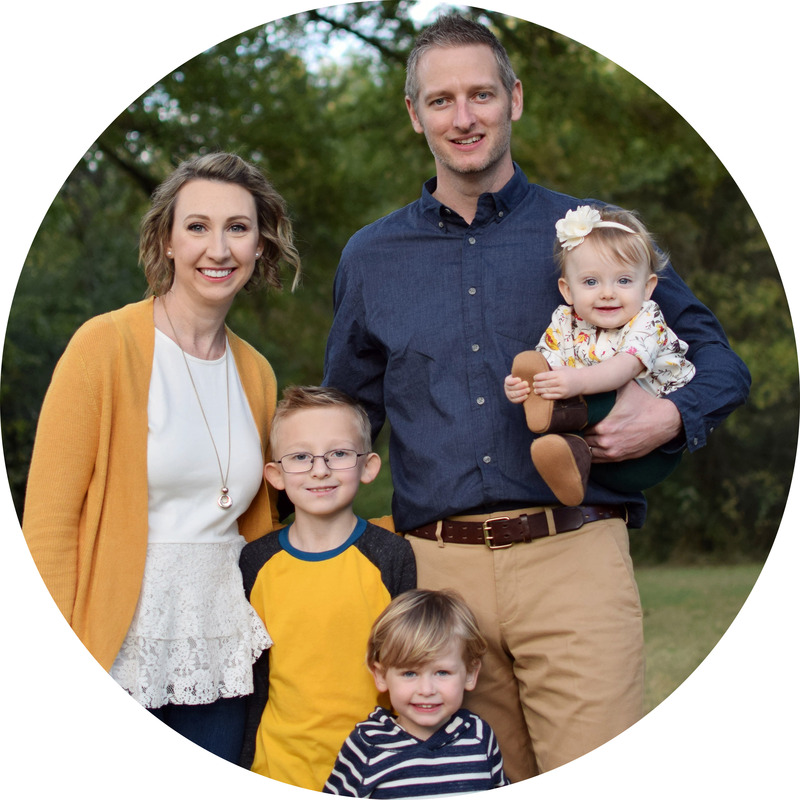 We appreciate you taking time to read about our story, and hopefully it helps give an inside glimpse into the life as a heart family! In the next few days, I'll be sharing some resources and specific ways YOU can help be a part of the awareness campaign!